The Sacco and Vanzetti trial and executions made headlines across America during the 1920s. But there’s another part of Italian immigrant history in America that might be overlooked by students of history—death by lynching. 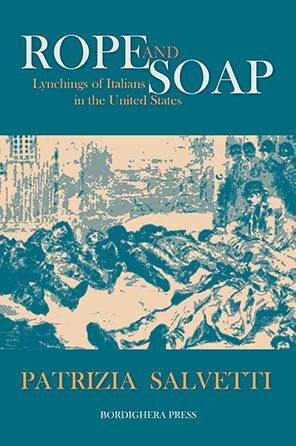 Patrizia Salvetti’s book, “Rope and Soap,” does a superb job of researching and presenting this tragic period for people of Italian descent, from the late 1800s to the early 1900s. 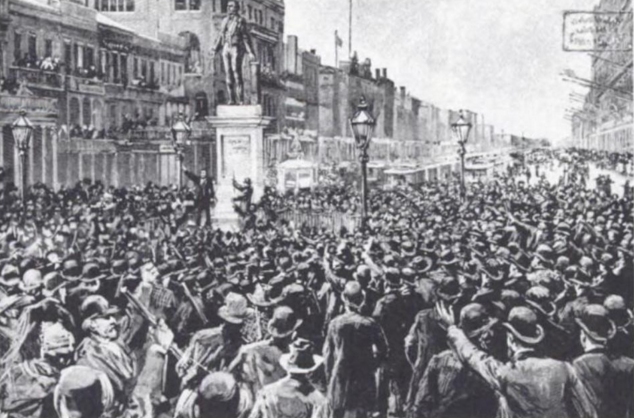 The 1891 New Orleans’ hanging of 11 Italians is the largest mass lynching in U.S. history. Salvetti, a professor of history at the University of Rome, Sapienza, employs a scholar’s approach in her book. Filled with copious facts from the first page to the last, you’ll get a history lesson that will enlighten you about the Italian experience in America. Why were Italians targeted for hanging? Why were they looked upon by non-Italians as a “lower rung” on the ladder toward prosperity, acceptance and justice? Salvetti provides answers with deep and insightful examination about the ethnic, political, and economic factors weighing upon people of Italian ancestry. From the Vicksburg, Miss., lynching of an Italian citizen in 1886, to the Tampa, Fla., lynching of two Italians in 1910, Salvetti delivers a powerful historical discourse. You might think this book is heavy reading, but it’s actually a thought-provoking look into a weighty subject—intolerance of Italians. – Review by Robert Fanelli Bartus Jr. This review appeared in the Spring 2018 issue of NIAF’s Ambassador Magazine. Bordighera Press: 212 pages. $18 paperback. Available on Amazon and Barnes & Noble. 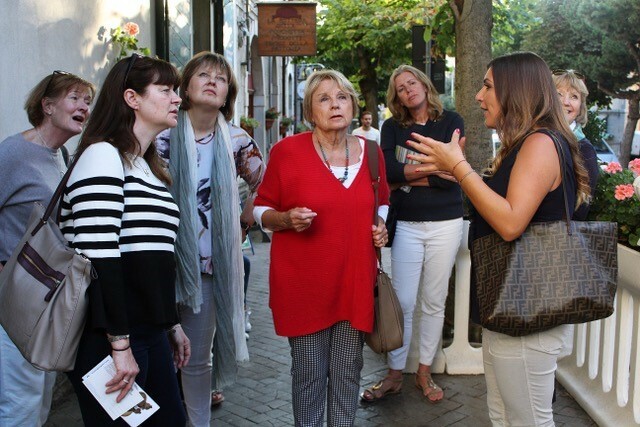 In this week’s #NIAFblog, our guest blogger, Jenifer Landor – founder of Live and Learn Italian, an immersive, language-learning travel experience – offers an inside look into her company’s travel program, which focus on learning about Italian language and culture. And it’s actually a thrill – a fact confirmed by those who join our program each summer. Many of our participants are somewhat older, but they still find such joy and satisfaction from the relatively new obsession of conversing in another language! My top tip is: do a little something every day. Talk to yourself, read out-loud, put on headphones with Italian language podcasts or music when you’re walking, or in the car or on the bus … say buongiorno to the barista in your local coffee shop. By all means, find a buddy on Skype for conversation exchange, but don’t neglect learning grammar. After all, a sentence can’t be formed without grammar. And taking lessons, even if on-line, is a must. Then, of course, go to Italy. Most Italian-learners have visited Florence, Venice and Rome, and lust for more, which gets them yearning to communicate. Get away from the tourists, and you’ll find myriad opportunities for practice. Italians are charmed and delighted when a foreigner speaks in their language – no matter how hesitant. So, reinvent yourself – you can be more playful in a second language, funnier even. The more you try, the wider your comfort zone. Make mistakes…it’s pointless to be shy or worried about getting it wrong. Through my quest to learn the language of my family, I discovered a rich community, which I now feel very much a part of. It’s completely different from living in a big, multicultural city. Simple, shared traditions bind people together; festival days punctuate the calendar, foods welcome in the seasons. The locals’ love and attachment to their traditions are strong. Campanilismo, an exaggerated attachment to ones own town (or bell tower!) translates as parochialism, which, in English, is not a positive term. In Italian… well, it makes Italy Italy! 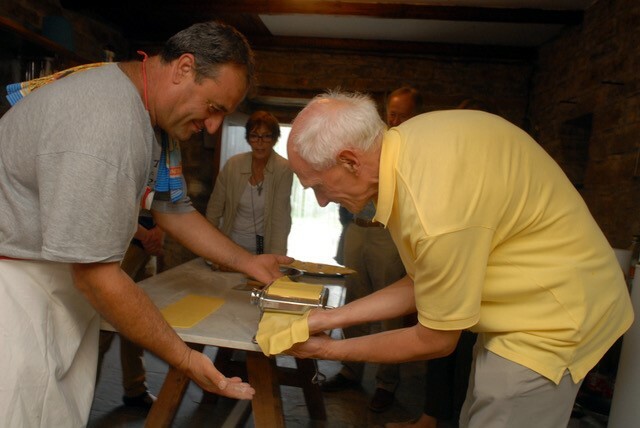 I created a language and culture program in Italy, inspired by this rich community: the family Di Nucci, making award-wining cheese for 12 generations; a young copper-smith, working hard to stay productive so he can raise his family in the town of his birth; the baker, Tonino, who is not only a master of bread, but a poet and playwright, writing in the town’s ancient dialect; Marco, who abandoned a global career to come back to his land, reviving vines and orchards and raising animals; Nicola, director of the bibliotecca antica, a keen horseman leading visitors along the ancient traturri of the shepherds; and in the world’s oldest bell foundry, the 25th generation of my grandfather’s cousins still make artisan bells by hand. These are just a handful of friends who welcome our guests, and connect with them to help them learn the language. This summer, we are continuing to host sessions for intermediate and more advanced learners, and adding a Not Quite Beginner session in September. If you have some familiarity with the Italian language, but never managed to really make progress, this is the program for you. You are invited to share in the daily lives of a traditional community – to cook with them, hear their history and traditions – and explore the slow life. Below, you’ll find the experience of John Mucciolo, one of our NIAF Congressional Fellows, and what he gained from his fellowship in American government. It’s a fair question, and one that I was often called upon to answer during my semester as a fellow in the office of Congressman Steve Scalise. Whether it was guests stopping by the office on official business, constituents on a tour of the Capitol Building, or even staffers and other interns in the office, people seemed perplexed to learn that I worked for Rep. Scalise. I, for one, never understood why people found it so shocking that a kid from New Jersey and studying in Baltimore would end up working in the Washington, D.C., office of a congressman from Louisiana. Seems like a natural fit to me! Alright, so I understand why some people might have been initially confused when I told them where I came from. No, Mr. Scalise is not literally my representative in Congress, but our shared Italian American heritage makes us a part of a community that is as closely-knit as any congressional district. Thanks to the NIAF Congressional Fellowship program, I was able to have a front row seat to the excitement of Capitol Hill, and I was lucky enough to do it while working for a fellow proud Italian American. 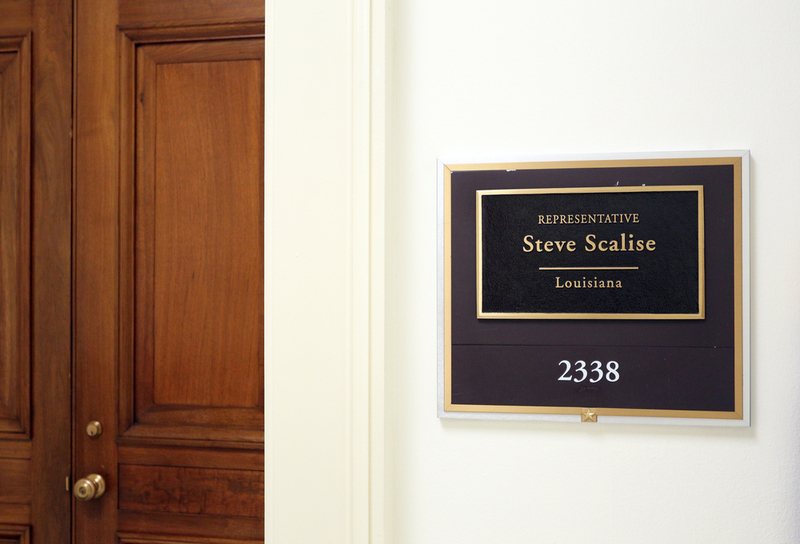 From attending hearings, to serving constituents, to working in the Whip’s office, having the opportunity to work for Congressman Scalise gave me unique insight into the inner workings of our government that I won’t soon forget. This experience was magnified by the fact that I was able to serve an Italian American member of Congress. As a young Italian American, it is always inspiring to see other members of the Italian American community succeed. This is especially true of Congressman Scalise, who has faced incredible adversity this year with nothing but great faith and optimism. 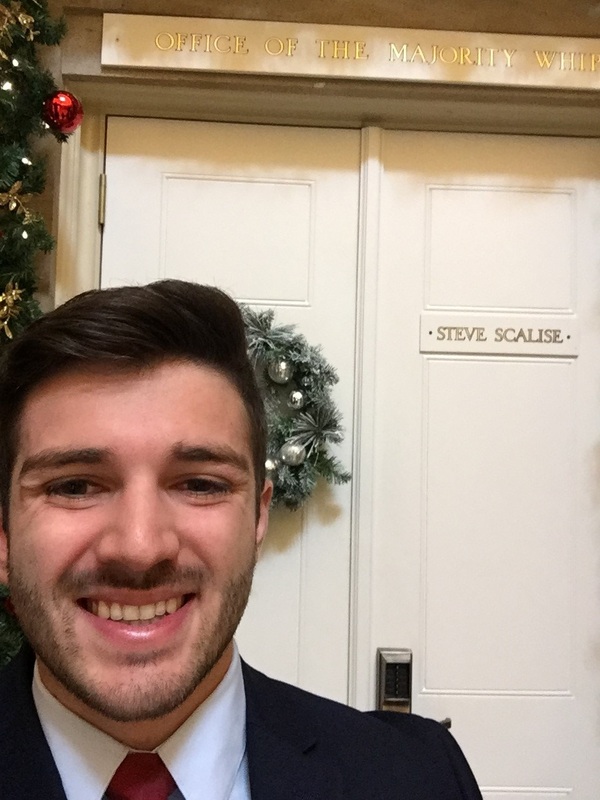 While I can’t say with certainty where my career path will lead me, I do know one thing for sure: wherever I do end up, everything that I have learned this semester in Congressman Scalise’s office will have played a huge part in getting me there, and I’ll be forever grateful for this opportunity. 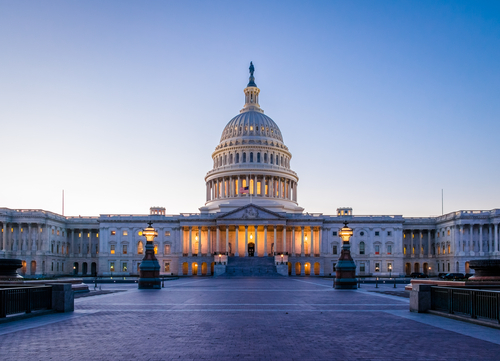 NIAF is currently accepting applications for the 2018 NIAF Congressional Fellowship, taking place this fall. The deadline to apply has been extended to May 7, 2018. For more information, click here. 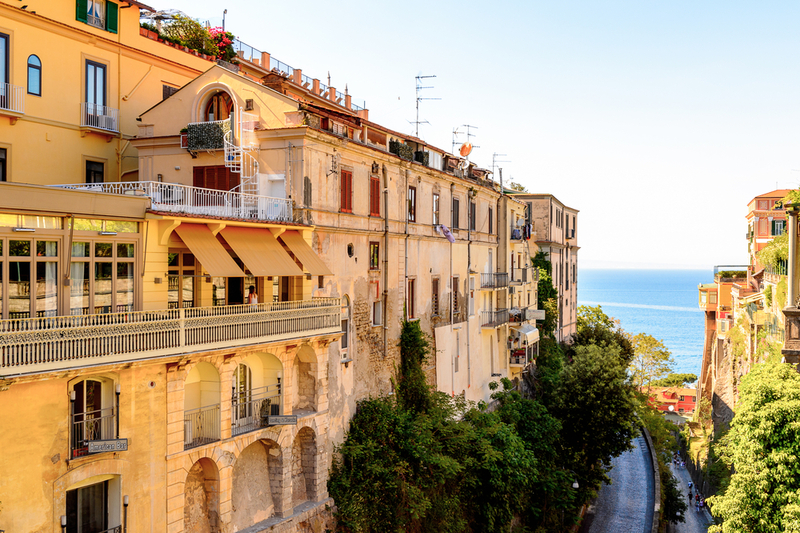 The National Italian American Foundation (NIAF) is proud to have the Sant’Anna Institute – a study abroad and language course program in Sorrento, Italy – as a corporate sponsor of our foundation. 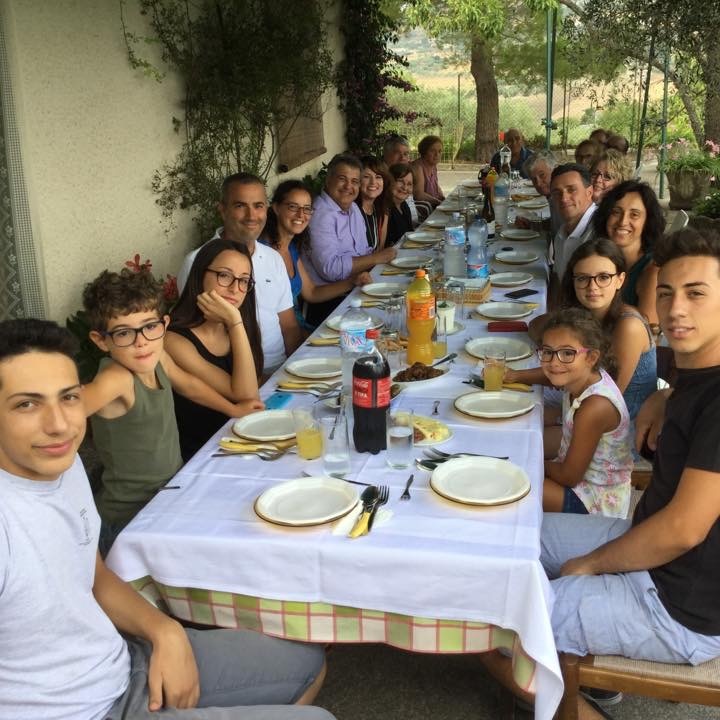 Read on for an incredible story from one of Sant’Anna’s Italian American students, Tristan Curnow, who attended their spring 2017 program. During the first semester of my sophomore year of college, I decided that I wanted to study abroad. I had heard the amazing stories of study abroad experiences through my friends and school administrators, so I figured it was time for me to experience the world, considering I had never left the continent that I was born and raised on. 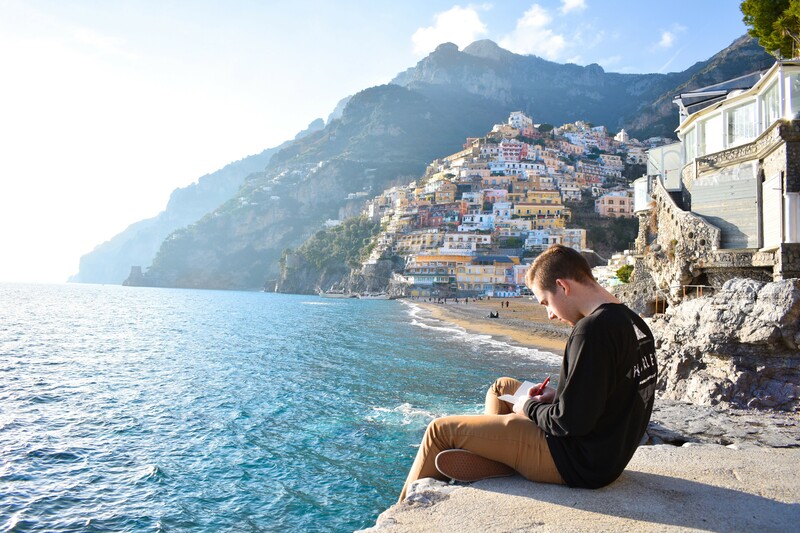 As I began to research different study abroad locations around the world, I realized that something in my heart was calling me to study in Italy. My grandmother (or as I call her, Nonna) was born and raised in Naples, Italy and didn’t immigrate to the United States until she married an American sailor stationed in Naples (my grandfather) when she was in her twenties. Once I had settled on Italy, I began to search for the perfect city that would fit my personality and academic credit needs. I didn’t want to study in Rome or Florence because I am not much of a city person. 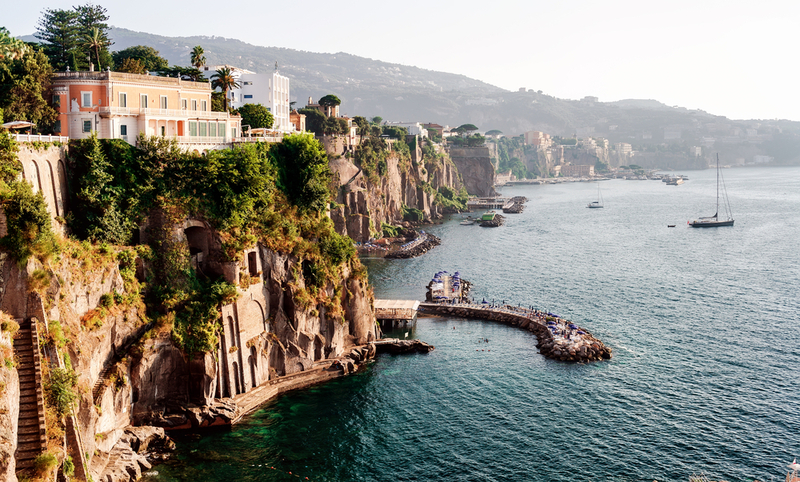 I have grown up my whole life loving the ocean, so when I discovered Sant’Anna Institute in Sorrento, I realized it was perfect. I could study right next to the ocean in a beautiful town that I knew wouldn’t have too many other American influences and to top it off, it was only thirty minutes away from my ancestral home, Napoli. When she was a girl, after World War II, her mother died and her father was too poor to support her and her two siblings. He had to send them to live in an orphanage for some time so they could be fed and taken care of. She was sent to live in an orphanage and girl’s school in Sorrento, Italy! I couldn’t believe that I had forgotten that small detail, which I had heard a hundred times. I immediately looked up orphanages in Sorrento and what I discovered sent shivers down my spine. The only orphanage and girl’s school open in Sorrento at the time of my Nonna’s childhood had since closed, but the building still stood to this day. It had since been converted into a small institute for study abroad students: Sant’Anna Institute. I could hardly believe what I found and where fate was about to lead me. During my time at Sant’Anna Institute, every day I would look out of the classroom window overlooking the bay of Napoli and Mt. Vesuvio. I would think about how my Nonna had also once looked out the very same window wondering if her life would get any better, if she would every have money or opportunities, and if she would every have a place to call her home. Two generations later, I realized that those questions had been answered. My Nonna, through hard work and determination had come to America and built a life and home for herself. She struggled to provide for her own children but raised them well to pull themselves out of poverty and two generations later, her first grandson was attending college classes in the same room that she once lived at the lowest point in her life. I have never felt such gratitude as I did when standing in those rooms. 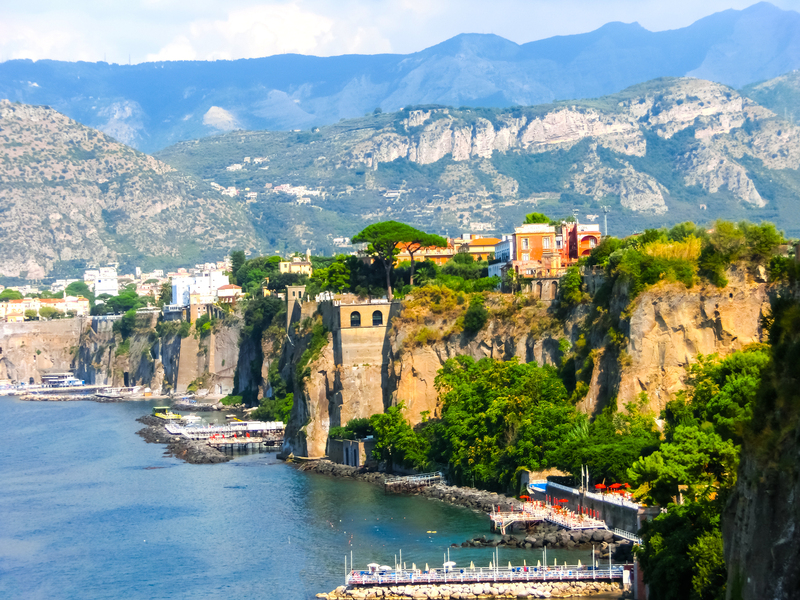 My time spent in Sorrento at Sant’Anna Institute changed my life. 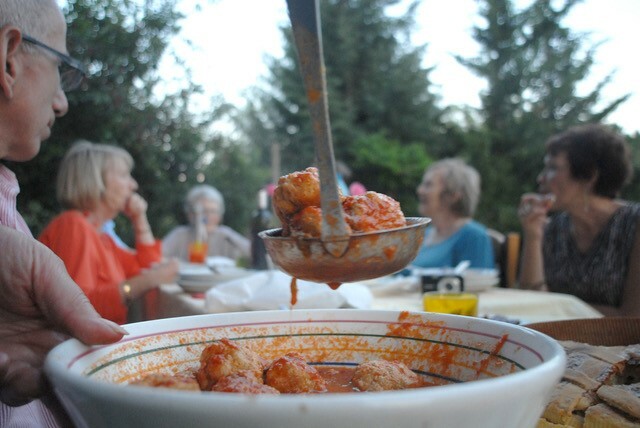 I learned to speak Italian, which I now use when talking to my Nonna on a regular basis. My experiences traveling and seeing the world changed my career path and led me to want to become an international lawyer. But most importantly, Sorrento became my home in a way that I never thought was possible. Now, when people ask me where I am from, I have a greater understanding for that which I came than I ever have before. I am Italian. 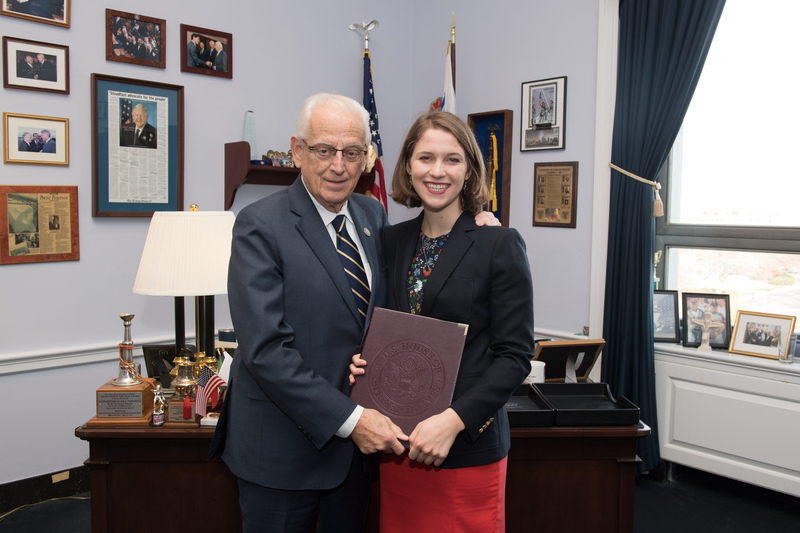 Below, you’ll find the experience of Natalie Wulderk, one of our NIAF Congressional Fellows, and what she gained from her fellowship in American government. Standing in the rotunda with my head tilted upwards to see the dome of the United States Capitol, I am astounded by the breathtaking fresco on the ceiling. Congress commissioned the Italian painter, Constantino Brumidi, to create the Apotheosis of Washington in 1865, which required him to be painting while suspended 180 feet in the air for 11 months until the project was complete. Brumidi’s masterpiece is by far my favorite and I cannot lead a tour of the Capitol without taking a moment to myself to look up and admire the detail, symbolism, and beauty of what lies in the heart of the United States Capitol. Not just as an American, but as an Italian American, I am reminded of my heritage and what Italians through the generations have contributed to the United States of America. I am honored to have interned for Congressman Bill Pascrell Jr. As a chairman to the Italian American Caucus and the representative from the 9th District of New Jersey, Congressman Pascrell is a leader in the Italian American Community. During my internship, I had the opportunity to attend briefings recognizing the intimate cooperation for NATO operations and business ventures between the US and Italy today, as well as attend events appreciating the Italian American culture and their noteworthy contributions to the United States. Furthermore, I was able to witness firsthand Congressman Pascrell’s values at work in his office. Congressman Pascrell says that his parents and his Italian-immigrant grandparents instilled in him the value of being a “bridge builder,” one who seeks to bring together diverse peoples in the community to make a better society. Being mindful of all of the constituents’ experiences and backgrounds who called the office, the staff and I treated them with dignity and respect. Constituents voices and opinions matter, which lead me to write briefing memorandums for Congressman Pascrell for legislation that his constituents supported. The American fundamental value of diversity is carried forward by Congressman Pascrell and my Italian relatives who made the uncertain journey to a new country to make a better life for themselves and their family. It is alive in our consciences and continually advocated for in the work Congressman Pascrell and others are doing on Capitol Hill. Witnessing that effort and taking part of representing a diverse constituent base as an intern was an invaluable experience that I will hold dear for the rest of my life. 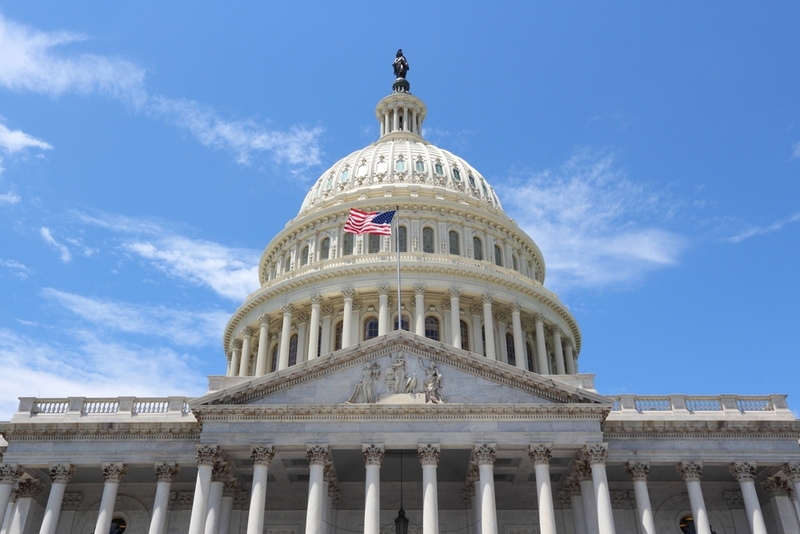 NIAF is currently accepting applications for the 2018 NIAF Congressional Fellowship, taking place this fall. Deadline to apply is April 30, 2018. For more information, click here. Words cannot adequately describe the experience that our family had with Roots ’n Tours during our visit to Sicily. We had asked Rosario and his team to help us do some research on our family prior to our trip. 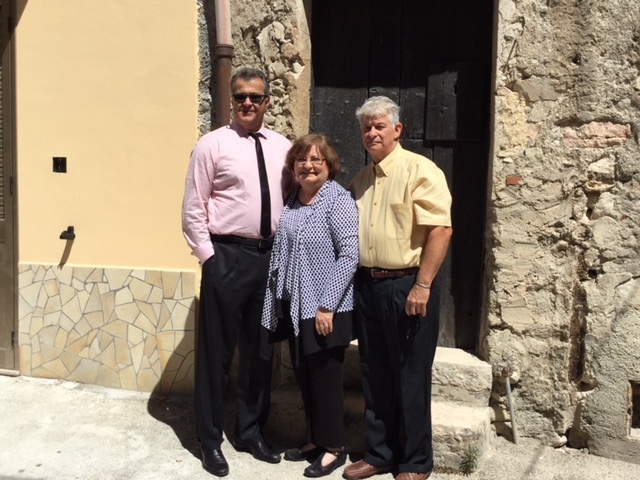 Through his team’s diligence and efforts, combined with some sheer luck, we were able to locate the direct descendants of my grandfather’s sister, who had stayed behind in Sicily when her three brothers immigrated to the United States. When we met our family, they simply said, “Welcome Home.” It truly felt as if we were, indeed, home. 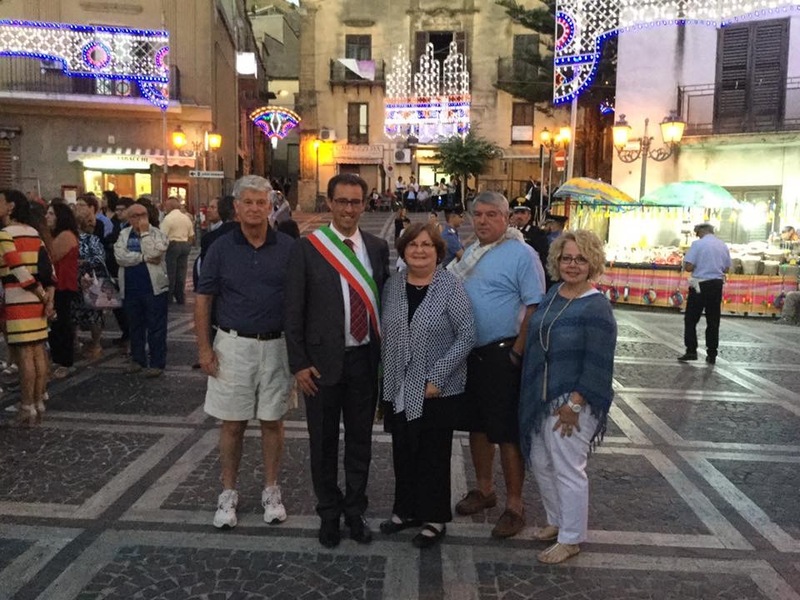 We were treated to a parade – complete with a band – along with Italian feasts over multiple days, which were prepared by our family for us at their homes. The most touching moment for us was being able to see our grandfather’s birth announcement, which was kept in the local records. It was wonderful to share this experience with my brother, sister, and our spouses. Exploring our heritage and finding this link to our past has allowed us to feel completed. We now better understand the love of family, faith, and food that our parents and grandparents shared with us. Most importantly, we now better appreciate the chance our grandparents took by leaving the land and ones they loved to make a better life for themselves and us in the United States. Italy is, without a doubt, a land of history and culture. 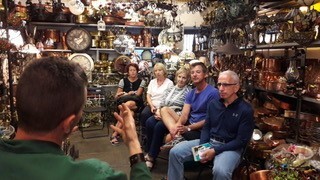 However, one of the main draws to Italy are the family roots and the origin of millions of people who left Italy in the past, but have maintained a solid connection to the land, its products and tales of their ancestry. That is, descendants of Italian immigrants, and the inexplicable pull they feel towards their ancestral homeland. In this kind of travel, the journey becomes an experience, and the experience becomes an emotion. The key elements of this travel format are the communities in the territory of the traveler’s journey, especially in the lesser-known parts of Italy, where the emigrants left from in the past. Today, there are 80 million descendants in the world from the 30 million compatriots who left Italy in the late 1800’s until the 1970’s. This enormous population is united by their Italian origins and their desire to keep the legacies of their personal histories alive. Italy has an incredible opportunity with these descendants of Italian immigrants to solidify its role of excellence in tourism. 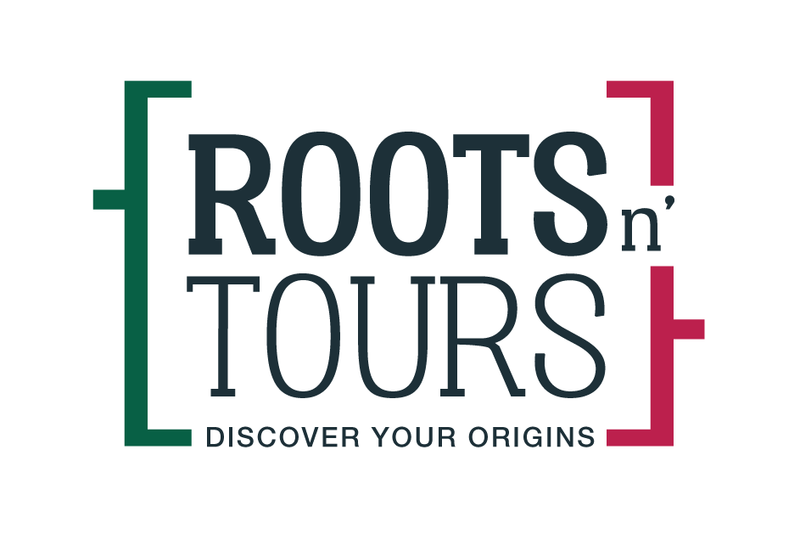 Roots ‘n Tours was created to connect travelers with their distant Italian families, while also expanding their knowledge of their Italian heritage and how it relates to Italian culture and history as a whole. Want to learn more? Click here and book your tour to Italy today! In this week’s #NIAFblog, our guest blogger, Jenifer Landor – founder of Live and Learn Italian – offers an inside look into a typical day on her company’s travel program, which focus on learning about Italian language and culture. Filippo learned how to work copper as a kid, playing beside his grandfather, in the workshop of his grandfather. 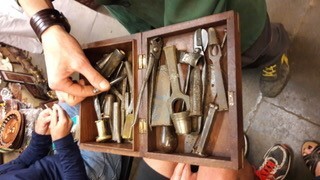 In the 1900’s, the D’Aloise workshop made specialist instruments for measuring and weighing, gradually introducing copper, iron and brass-work. 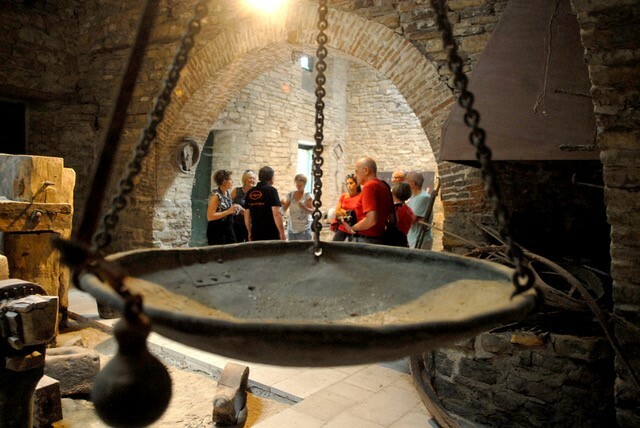 Agnone’s economy was very strong, and its hand-finished copper was much sought after due to the strict standards of its local guilds. 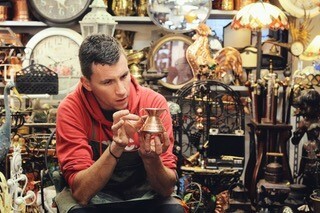 Today, Filippo continues to work in copper, brass and iron. Many of the shop’s articles are decorative, but there are plenty who really appreciate a copper casserole with a tight-fitting lid. Prepared in the copper casserole, the food is perfectly cooked thanks to the surrounding heat keeping the things completely uniform. They are truly little works of art. Restoration work also keeps Filippo busy; there’s a current trend for taking inherited copper pots off the chimney breast and using them again, for cooking and making wine. Many of these items had been previously discarded – too bitter a reminder of poverty and struggle. Now, with a bit more distance, the beauty and craft of these hand-made objects are once again being appreciated. Local people are coming into the shop asking for ‘la tina di nonna’ to be repaired and polished. This part of Italy has seen a long economic decline, and with the copper trade disappearing, Filippo went off to Rome to study engineering. He lasted two years. His destiny was to be a ramai. No longer in higher education, he first had to complete military service, but he completed that in time to get back and work through his apprenticeship while his nonno was still alive. For the next 11 years, they worked side by side. Over time, Filippo’s confidence grew, and he started to take the initiative, exploring new ways to keep the business healthy – building a website, for example. He did have to explain to his grandfather that no, he was not playing computer games, he was working – and taking orders from Japan! When nonno passed away in 2008, Filippo was ready to take the reins. He is one of several young entrepreneurs in this small town finding a way to stay put. They know they are blessed to have inherited a artisan trade, and a family business spanning generations. Their children are growing up in a tight knit community with grandparents and cousins part of their lives. The beauty of their land and the pride they take in their history is keenly felt. To nurture and preserve these things for the next generation is their privilege. LIVE AND LEARN ITALIAN offers language and culture holidays in the small historic town of Agnone, Alto Molise, far from tourism. 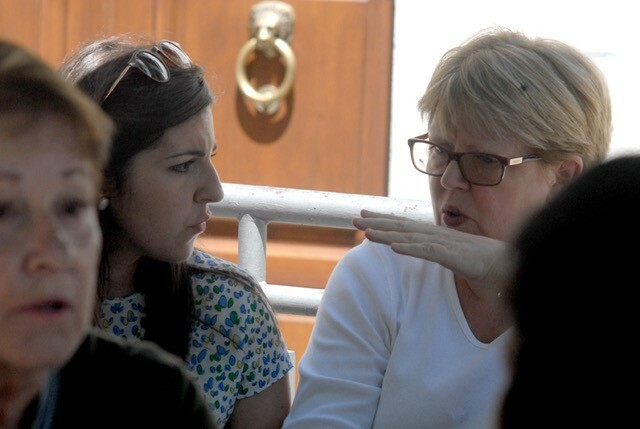 Mature students of Italian come to live among a friendly community to practice, improve, listen and engage. Cook with the locals, visit family businesses, and discover the culture and history of a beautiful region. A special, featured blog by NIAF’s Board of Directors Member and Executive Vice President of Scholarships, Grants and Youth Activities, Robert V. Allegrini. It’s cold and dark, but – fortunately – hairless inside the left nostril of Hillary Clinton as I pop my head in it while examining a giant paper-mâché replica of her head, which is seemingly discarded outside one of the enormous hangers at the Cittadella del Carnevale. 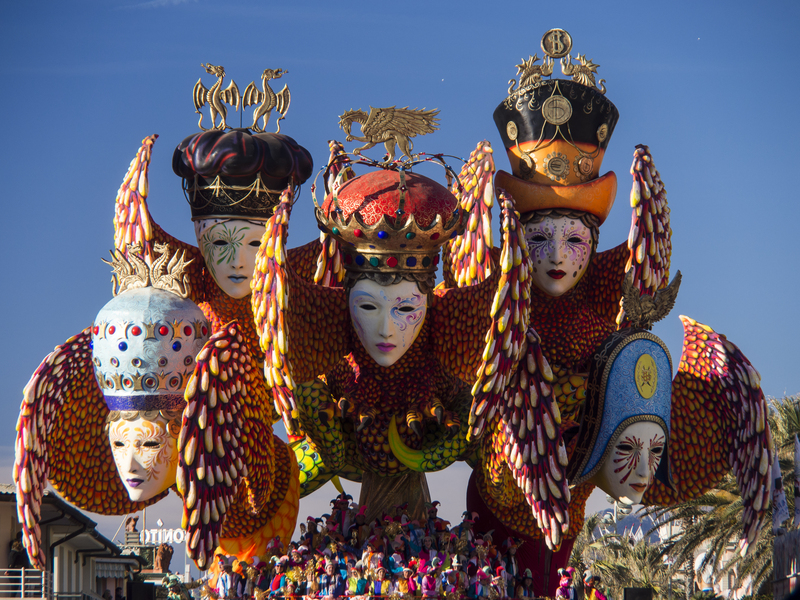 The “Citadel of the Carnival” serves as a workshop where magnificent floats are assembled for Italy’s best-loved carnival, the Carnival of Viareggio – a lovely seaside town in Tuscany that is less than an hour from Lucca. The Italians have always known how to throw a good party. After all, the very term bacchanalian comes from the debauchery of Roman “bacchanalia.” So when it comes to Carnival, it is no surprise that Italy need not take a backseat to Rio De Janiero nor New Orleans. In fact, the Italians boast numerous noteworthy Carnival celebrations, from the elegant masked parties in Venice, to the raucous Carnival of the Oranges in Ivrea. But it’s the Carnival in Viareggio which truly captures the Italian spirit. That’s because the main event of the Carnival of Viareggio is its parades showcasing huge paper-mâché floats that are marvelously unique in terms of their size, movement, choreography and sensational subject matter. Each float, which can be 5 or 6 stories tall, portrays a satiric vignette featuring caricatures of Italy’s, and indeed the world’s, most newsworthy personalities and events. These floats play on many Italian sensibilities – an affinity for irreverence and Fellini-esque absurdity as well as an admiration for great creativity, artistry and design. There is also an appreciation for the liberating sense that comes from mocking the rich and famous – literally in effigy. The effect is breathtaking travelling theater set amidst the backdrop of a seaside promenade, flanked by gorgeous liberty-style buildings and extraordinary squares overlooking the beach. Many elements of this theater were on display as I toured the Citadella del Carnevale and its unique museum, which is open to the public. Simultaneously whimsical, creepy and informative, the museum gives one the sensation of being in the midst of a dream world of giant Jack-In-The-Boxes, where paper-mâché heads all littered around each turn. Amidst the heads, the story of this unique carnival unfolds. 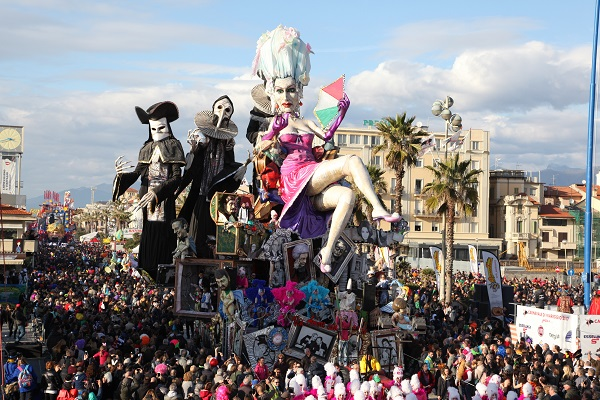 I learned that the Carnival dates back to 1873 and that the addition of paper-mâché floats dates back to 1925, when the Viareggio-born painter and builder Antonio D’Arliano perfected the technique of casted and molded paper. 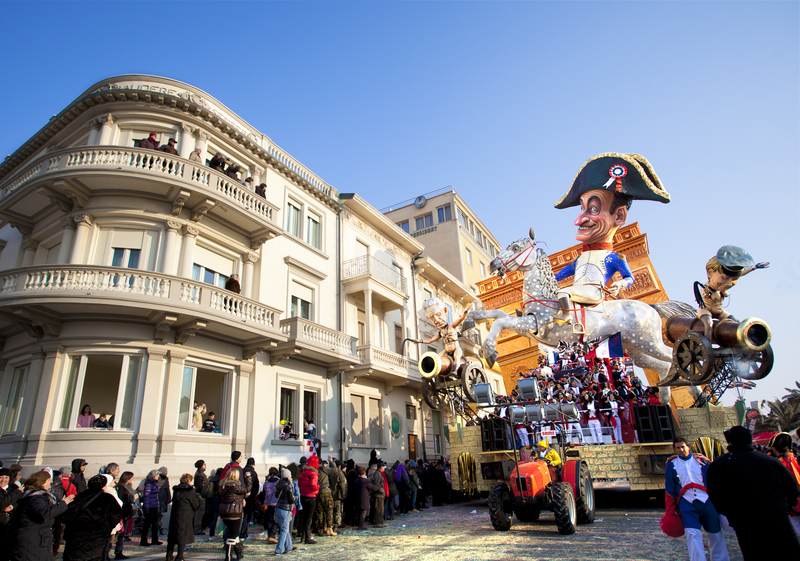 Since that time, the parades have evolved into highly organized affairs governed by the Fondazione Carnevale, or Carnival Foundation, which each year provides grants for the top float designs to be built and provides prizes for the winner. Funding comes largely from a modest spectator admission fee for the parades. The floats are built by different teams in strict secrecy in the various hangers of the Cittadella del Carnevale. They are unveiled over the course of five carnival parades leading up to Fat Tuesday that take place over several weekends. Spread among the heads and the history at the museum are the beautiful, original artists sketches of some of the more famous floats along with photos of the finished products. 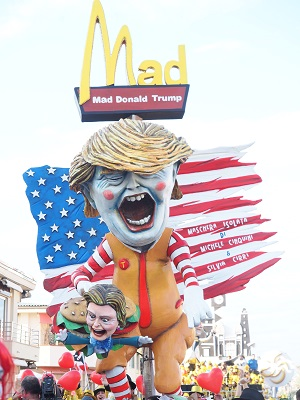 I laughed aloud at a photo of the clever and witty float entitled “Mad Donald Trump” which played off the similar sounding “McDonald Trump” and featured a menacing President Trump dressed as Ronald McDonald. President Trump also featured into one of the principle floats of last year’s parades entitled “Bang Bang,” which showcased a typically European perspective on the defense of firearms in Trump’s America by hearkening back to the lawless days of a western saloon. Italian politicians are certainly not spared either. In one of last year’s floats entitled “Such a Great Love,” Italy was portrayed as a beautiful woman sitting atop a pile of silver framed pictures of her past suitors, such as prime ministers Giulio Andreotti and Bettino Craxi. The implication was that some of her suitors have exploited the beautiful woman for their own interests. From the museum, visitors can go to a special area at the Cittadella del Carnevale to see how the paper-mâché process works and to test out your own skills in the technique. The area resembles a graveyard of skeletal parts with frames and casts for fabricating everything from hands and feet to eyes and ears. Here, you can see how some old newspaper and a simple paste of flower and water can be transformed into a work of art that inspires and entertains. 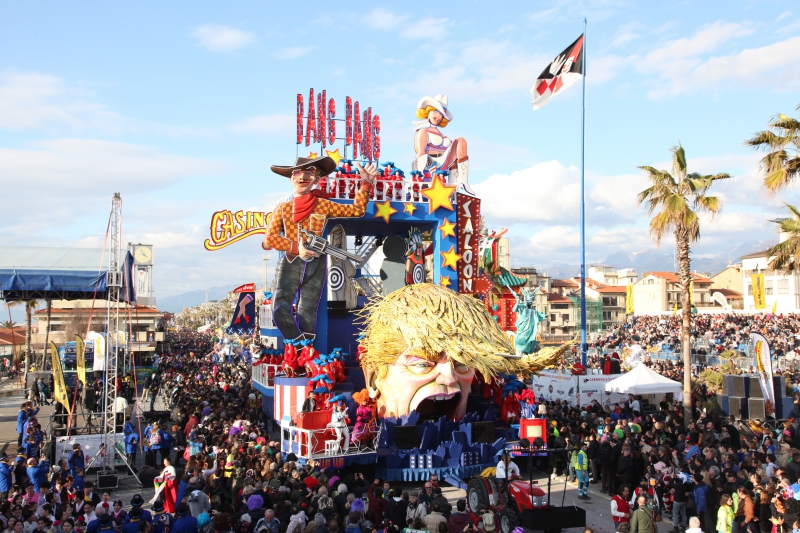 Each year, the Carnival of Viareggio draws over 600,000 attendees, making it one of the most important carnival celebrations in the world. For the forty days and nights of Lent, Viareggio becomes, as the local tourist authorities put it, “the Italian factory of merriment and fun.” For the entire month of February, Viareggio offers visitors an extraordinary program of events, which includes an array of concerts and jam sessions in the city’s different districts, masked dancing balls, fireworks, theatrical performances, cultural events and sporting competitions. But the most longed-for and anxiously-awaited moments are those of the parades of gargantuan floats – the Corsi Mascherati. 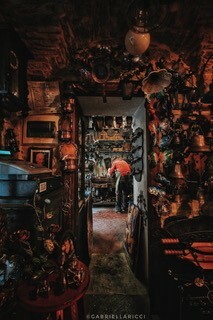 Here, you have five extraordinary opportunities to admire the outstanding allegorical machines created and built by artists from Viareggio up close while allowing yourself to be swept up in the vibrancy of the masks, of the music, and by the beauty of the largest show of its kind in the world. Caffeinated- up, we cross to Palazzo Bonanni for a morning of Italian with Alessandro and Giovanna, both fully qualified to teach Italian to stranieri. Lessons in very small groups allow them to structure learning pretty individually. At break, in the piazza, Francesco the butcher is interested to know where we have come from, and why? He interrupts his sausage making to sell us a picnic lunch to have on the terrace after class with un bicchiere di vino – the softest prosciutto and local cheeses, and it’s easy to engage in conversation. After lunch, a refreshing siesta is followed by some pronomi revision and, when the town wakes up again, half of the group walks over to the bell foundry to find Ivo, well-versed in talking piano, piano, and getting us to speak by prompting questions. The foundry really hasn’t changed since the Middle Ages, each unique bell hand crafted over three months. The casting is a dramatic and emotional event, attended by a priest or bishop, who recites prayers. 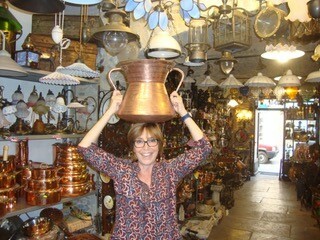 It’s quite an experience to be in the oldest bell foundry in the world – making the bells for the Pope! Maria then invites the rest of us into her home to cook simple, seasonal food. We start by making pasta from scratch, and there’s always someone who takes to the kneading like a pro. While the dough rests, a quick batter is made – we stuff zucchini flowers with mozzarella and anchovies, dip them in the batter, and then fry them. How much flour? Quanto basta, Maria says – as much as you need. Creating fresh ravioli with ricotta and spinach turns out to be a breeze with Maria at the helm, and the tomatoes we stuff them with were picked today. Later, we admire the tablecloth she’s embroidering and watch as she makes lace on the tombolo. There is no end to her skills – le mani di Maria non hanno prezzo – Maria’s hands are priceless, her daughter-in-law says. Cooking together helps loosen inhibitions, and Maria and her family don’t speak English anyway, so we all have a glass of wine and join in on the conversation. We share dinner around a big table in the garden, joined now by the bell foundry visitors, and it is simply delicious. Just when you can’t eat another thing, out comes a crostata Maria made earlier with home-made apricot jam. Although we are all full, we are offered different digestivi (laurel, amarena, mint…. ), and we all manage to eat a piece of the crostata. 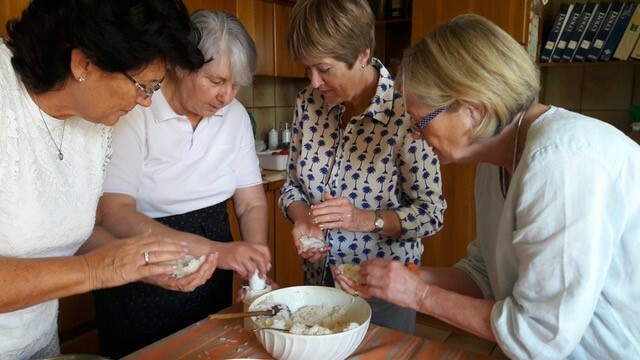 No two weeks are the same at Live and Learn Italian – the program is structured, but there’s plenty of flexibility to explore. Events depend to an extent on what’s going on at the time. 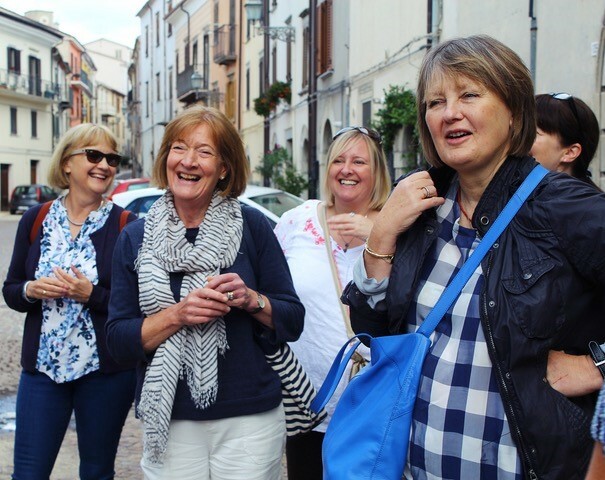 We meet whoever’s interesting, do whatever helps us learn and practice Italian, and go wherever engaging people draw us in for a stimulating and sociable convivial program. 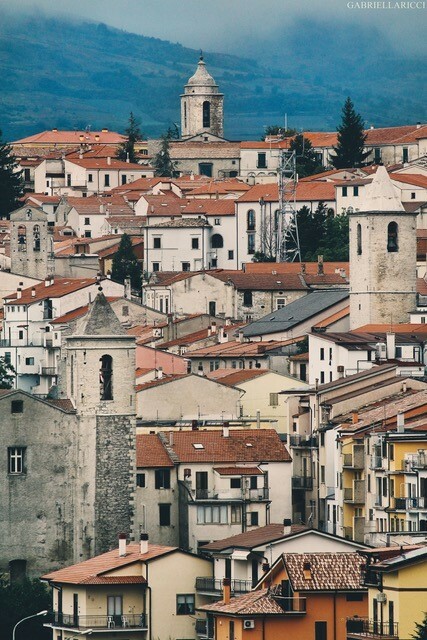 I first visited the historic town of Agnone to trace my family’s roots and learn the language. 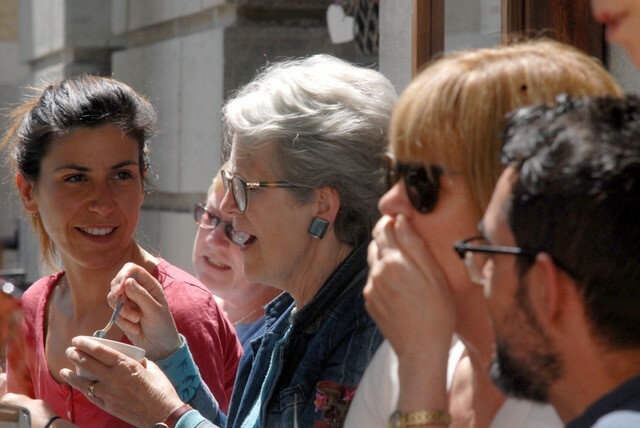 Inspired to share this unique experience, I founded Live and Learn Italian; with a rich cultural history, world-class artisans, and exceptional local produce – Agnone is the perfect place to learn Italian! 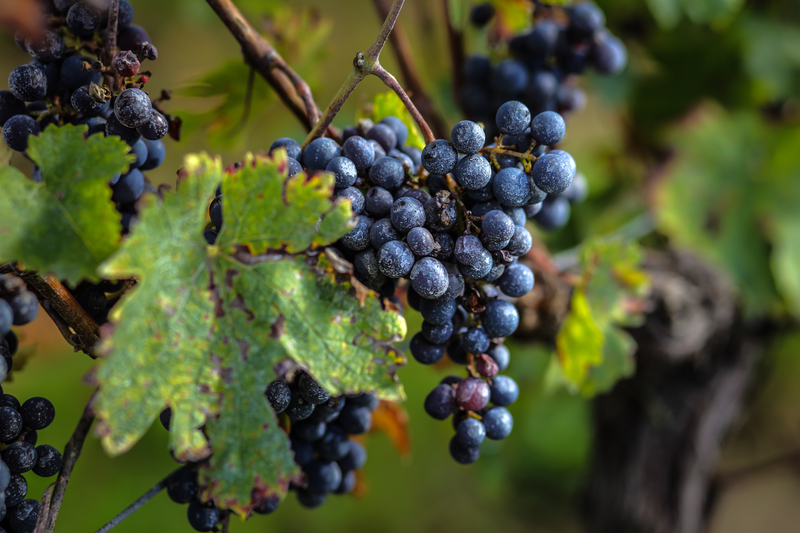 The origins of today’s wine harvest date from the early 1900’s, but a lot of the traditions go even farther back. Well before the birth of Christ, the Romans used rudimentary techniques to ferment the juice of grapes, which even then were a much-prized fruit on every banquet table. 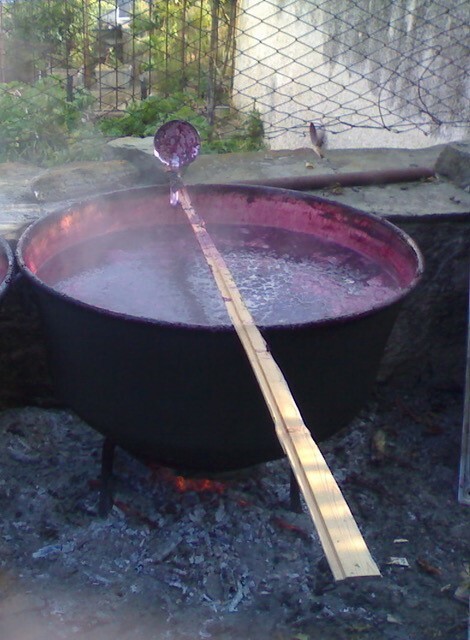 Every casa has its own particular methods for making wine, but the basic process is pretty much the same. 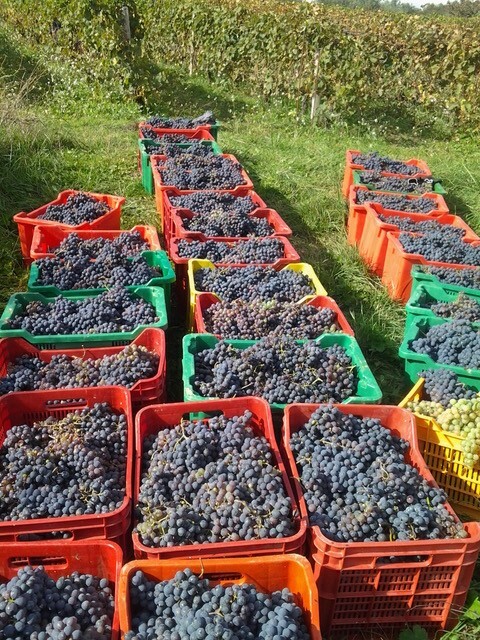 We start pressing as soon as the grapes are harvested, which in our vineyard takes all day. 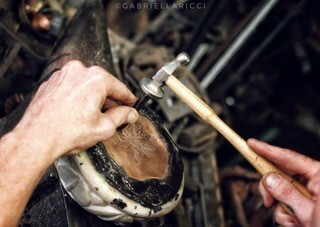 To discover and re-live these traditions is a fundamental part of l’Azienda A.M.A. Green and this year, thanks to the Angelo Marinelli family, it was an incredible experience. 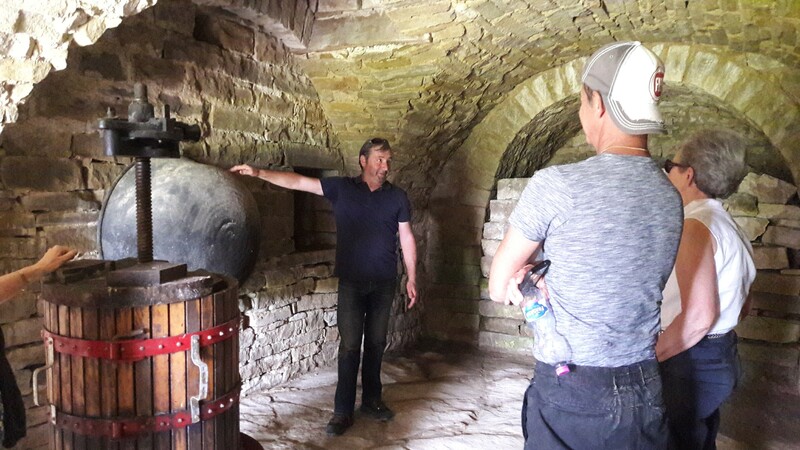 We lived a traditional Agnonese Vendemmia, using the 18th century stone vat, preserved in the cantina for all these years, and pressing the grapes by hand – or rather, by foot! This is how it was done before mechanization and has its advantages – the stalks remain intact, keeping the slightly bitter, woody taste out of the wine. Keeping a vineyard is a serious business. 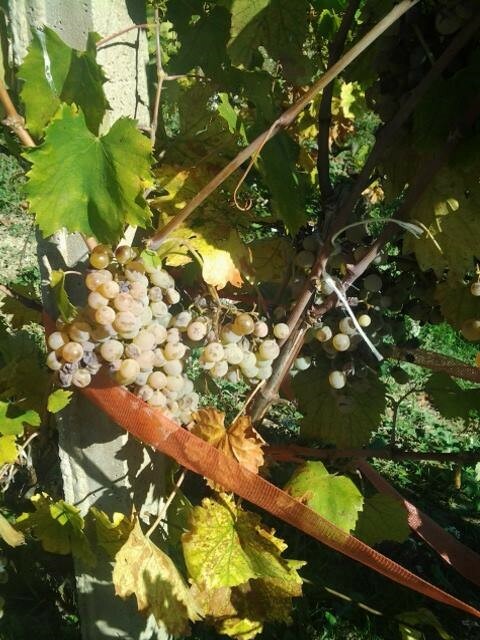 Regular pruning, weekly application of copper oxy-chloride to prevent fungus, and constant weeding are all required to protect the fruit from parasites. 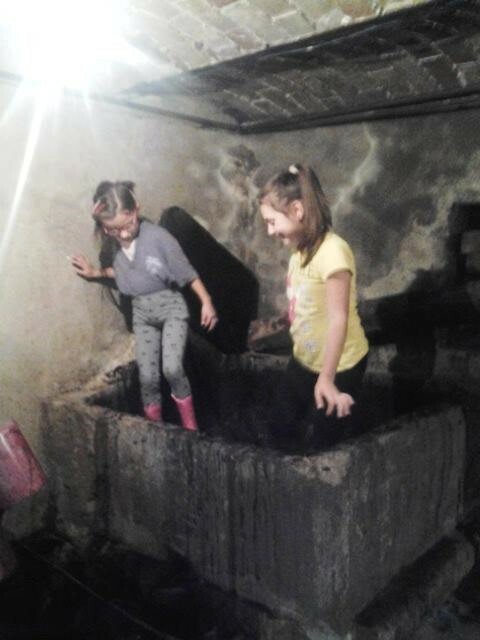 Then, in preparation of the harvest, we scrub the boxes and crates, as well as the copper tubs and wine presses, completely clean for storage. This is fundamental for preventing any parasites or mold that could destroy the must during fermentation. La vendemmia is a ritual and a festival; it is hard work, but a lot of fun. In the last 10 years in our region, the harvest has grown in importance. Friends, relatives and neighbors all come to help. Early in the morning, we share breakfast together, and once fortified, we head for the vines. There’s great excitement and emotion when the first bunch of grapes is harvested, and the smell of the ripened fruit gets everyone going. Harvest stories and folklore are passed down through the generations: types of agricultural methods used, changing religious rituals, and the culinary and contadine traditions. 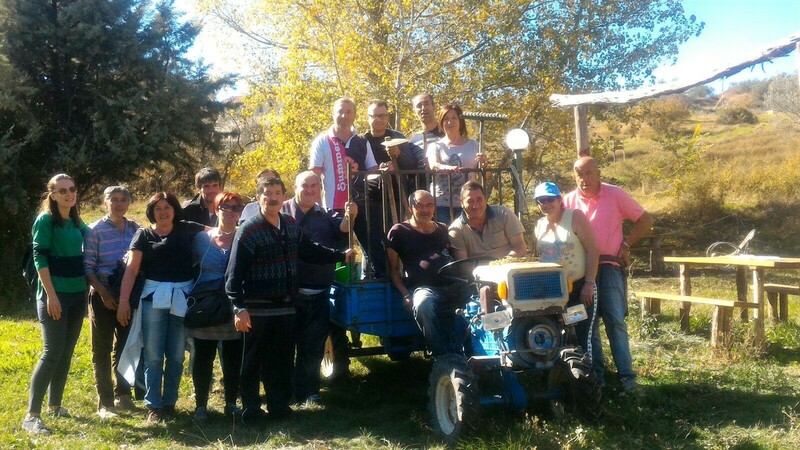 Besides being of cultural significance, the annual vendemmia is an important social cohesion for the community. Later in the morning we share produce from our land – homemade breads, different types of salami, frittata, and, of course, a good wine. 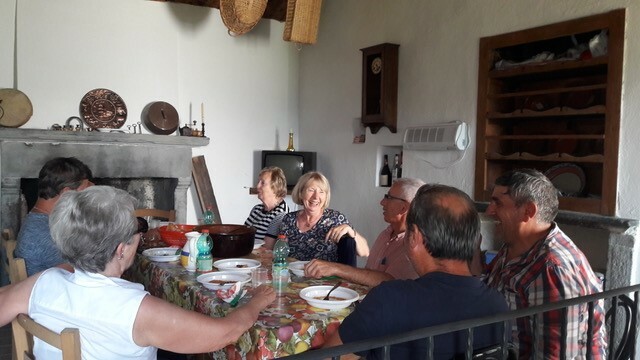 In the evening, we gathered for the harvest feast to celebrate, starting with a selection of antipasti, then the traditional Agnonese pasta, sagne a tacconi. A baked pork dish followed, accompanied by grilled peppers and green beans from the garden. Over the long evening with song and stories, we got through various dolci and amari. Life today gets busier and busier, and time is precious. Yet it’s an enormous thrill to rediscover these activities, and to capture flavors that we’re in danger of loosing and forgetting. La Vendemmia 2017 was a great pleasure for us all. You can live this, and all kinds of experiences, at our farm near Agnone. For more information, click below.